I sit in the audience for The Full Monty at The Marlowe Theatre, amongst an expectant crowd. I don’t really know what to expect – although I’ve seen the film, I wonder how this would translate to the stage (and whether it would work). 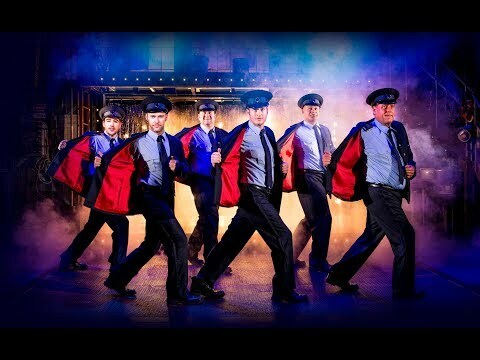 The Full Monty pulls in a lot of female attention (understandably) – it’s a bit of a ‘hen night’ crowd pleaser. Under the surface though it is a show that depicts male depression, unemployment, ego and male suicide. Whilst this is done with laughter in abundance, the message is still clear for all to see. The minimal, split level set does what it needs to do. It provides the perfect backdrop for a show set in Sheffield, in the 1970’s. The ensemble act as the stage crew – moving the set around in character in full view of the audience. The storyline transfers well onto the stage with all the classic film moments captured (six unemployed steelworkers, the dole queue, dancing to Hot Chocolate and the Arsenal off side trap). It is funny, the key characters and moments are all included. Gary Lucy plays Gaz, a likely lad who needs to earn some cash, so gathers a band of male strippers. He elicits a lot of screams from the females in the audience, a popular choice. Fraser Kelly plays Nathan, Gaz’s son and is a real talent on stage. The stand out for me is Kai Owen who plays Dave. Hilariously funny, witty, charismatic and with an air of vulnerability. Joe Gill is also fantastic as Lomper, an in the closet loser who makes friends and finds confidence in himself along the way.